The North Manchester Historical Society will host author Joe Krom for its program on Monday, October 13. Mr. Krom will speak on “The French on the Indiana Frontier.” The program will begin at 6:40 p.m. in the Assembly Room at Timbercrest Senior Living Community, 2201 East Street, North Manchester. According to Historical Society President Mary Chrastil, the group has wanted to host a program on area French explorers for some time. “Sometimes people think that German or English farmers were the first Europeans to come to this area. 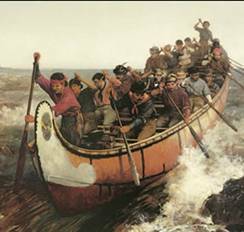 But French trappers and traders were a significant influence well before the British and Americans appeared.” French exploration of the region began with French-Canadian voyageurs in the 17th century, followed by missionaries and fur traders. The French called the region New France and built outposts from Quebec to St. Louis, including Fort Miami (now Fort Wayne) in 1697. They traversed Indiana streams and interacted with local tribes. They not only left their influence but left their names that carry on today. France ceded New France to Great Britain in 1763 at the end of the French and Indian War. Mr. Krom grew up in Wabash County along the Eel River. He was a member of Northfield’s first graduating class in 1963. He earned a BS from Manchester College and an MS from Indiana State University. 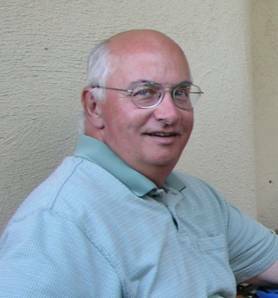 He taught mathematics and coached track in Indiana public schools for many years. Upon retirement, he began researching events contained in his novel “Heart of a Warrior: The True Saga of Sweet Breeze and William Wells,” which covers the Indiana frontier from the end of the Revolutionary War to the beginnings of the War of 1812. He and his wife Anita visited libraries, museums, and historic sites along the highways and byways. Tidbits of fact are woven with major historical events into a narrative that carries the reader through these troubled times. There is no cost for the program, which is free to the public. All are welcome. The public is also invited to come to the Assembly Room at 6 p.m. for a meal prior to the program. For those who wish to attend the dinner, reservations must be made no later than noon on Friday, October 10. The cost of the meal is $8.50, $3.50 for those on the Timbercrest meal plan. Reservations may be made by calling Evelyn at 260-982-6777, Mary at 260-982-1813 or the Center for History at 260-982-0672. 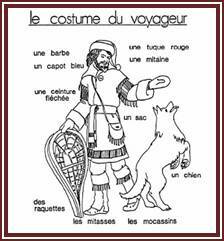 Typical voyageur clothing. A voyageur canoe and crew. Both images from Google Images.